Straight leg jeans are one of the biggest comeback trends of 2019. One look at Kendall Jenner's denim of choice, or the cuts Bella and Gigi Hadid are favouring, and you'll instantly see why the style has once again become a non-negotiable staple for women in-the-know. 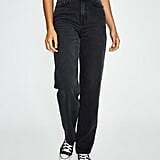 Not only do straight leg jeans have an innately cool vibe, the silhouette lends itself to a wide range of body types and can be styled back seamlessly with both heels and sneakers. If you're not totally convinced, the most popular jeans at General Pants Co. for 2019 should sway you. "The best-selling jean this year may come as a bit of a surprise, but our fashion- forward customer is loving a straight leg, in particular, the 'Playback' jean from Ksubi." confirmed womenswear buyer, Britt Gallagher. 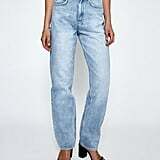 "Inspired by retro styles from the '80s and '90s, Ksubi's 'Playback' jean is made from light-wash rigid denim. With a very high rise on the waist they flatter the smallest part of your frame and fall to an elongated straight-leg. Our customer is loving to balance the proportions with a cropped or fitted tee as well as a heel for a PM look or sneaker for the oh so cool off duty look." Read on to shop the Ksubi Playback jeans in three colours — they'll become your second skin this season.